If you were to include just about every rocky outcrop of notable size, then you could count at least five-hundred-or-so off-shore islands off the coast of Ireland. However, only a handful of these islands have maintained a population through history, and even fewer-still have retained permanent residents into the present day. Through the early and high medieval period many of the smaller islands off the west coast attracted monastic settlers. Off the west coast, monastic settlements can be found on Skellig Michael, St. Macdara’s Island, Scattery Island and Inishmurray to name just a few, with the early monks being drawn to the isolation offered by these punishing out-posts. However, our period of interest is the 19th and 20th century, and the experiences of those who lived and were educated on these islands at that time. Examining the early mapping sources like the First Edition 6 Inch map (1834-1842), and First Edition 25 Inch map (1890-1911), it can be seen that up until the mid 20th century, there were some forty national schools located on islands off the coast of Ireland. Life on many of these islands could be harsh at the best of times, and by the 1950s, settlers on many of the smaller islands were encouraged to leave and settle on the mainland. The evacuation of the off-shore islands left many of the smaller islands desolate and empty, and consequently, the majority of the forty national schools once located on them were closed. For the past couple of months I’ve been slowly making my way out to many of these island school houses. Some have unfortunately been completely destroyed by the elements such as the school house once located on the eastern shore of Scattery Island, Co. Clare. 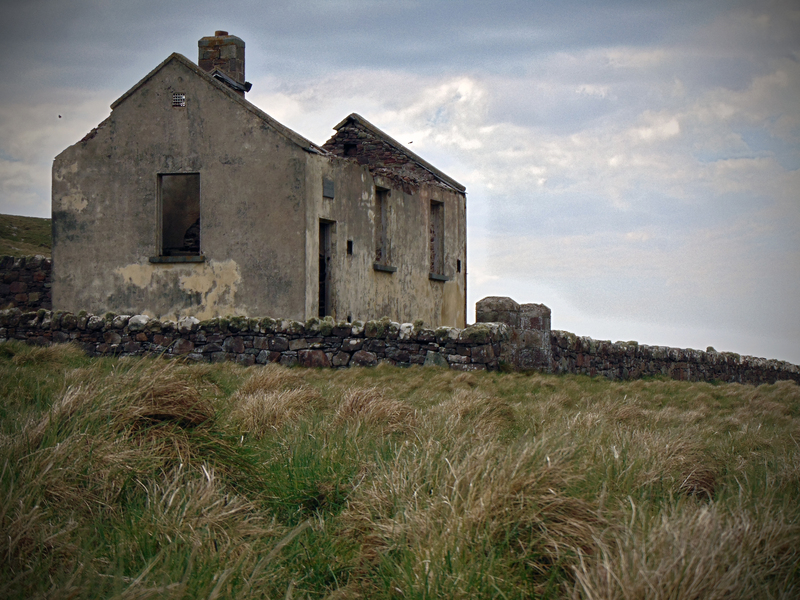 Others have been restored as holiday homes like the example on Dursey Island, Co. Cork. And some, such as the example featured here from Achill Beg, have been sitting vacant and abandoned since the island was evacuated in the mid-20th century. Achill beg is located just south of Achill Island off the Corraun Peninsula in Co. Mayo. The topography comprises two low, rocky hills with a shallow valley between. The island covers just 60 hectares and is separated from the rest of Achill by a narrow channel, the Blind Sound. Access to the island is from Cé Mhór, in the village of An Chloich Mhór (Cloghmore), by local arrangement. Nobody lives on Achill Beg anymore. Before the Great Famine of the 1840s its population was just under 200 people, but by the early 1960s it had decreased to just six. In 1965 Achillbeg was evacuated and the inhabitants were settled on Achill and the nearby mainland. Nowadays a handful of cottages have been restored as holiday homes though there are no permanent residents. Through the 19th and 20th centuries settlement was primarily on the eastern side of the island and in the saddle between the two low hills. It is in this saddle that you can find the remains of the island’s old school house dating to 1903. The school building comprises a detached, single-storey, three-bay, one-roomed school house of rubble and brick construction. Although very similar in form to the example from Sonnagh Old in Co. Galway, the school house on Achill Beg includes a tall, single-light window at it’s western gable which affords a spectacular view from the fireplace located at the opposing eastern gable. Time and the elements have most certainly taken their toll on the building, and all that remains today is the walling: the roof has collapsed and the bare remains are ghostly in their location. They stand as a simple tribute to the former population of the now deserted island. Inside, the wainscotting has largely been peeled from the walls and the floor has completely rotted. It is a cold and sorry sight. At Cé Mhór, in the village of An Chloich Mhór on the mainland I was lucky enough to meet Paddy Kilbane: born on Achill Beg and educated in the school house during the 1950s. He tells me that the fate of Achill Beg was sealed in the 1950s when electricity was brought to the locality, but not to the island. The islanders relied on oil lamps for light, and rechargeable batteries for the island’s one wireless set. They grew tired of the hardship, and one family after the next took their opportunity to leave and settle elsewhere; some on the mainland, some emigrating, never to return. Paddy himself spent his younger years in London but recounted tales of going to local dances on the mainland in his teens. When weather was rough and he and his friends could not row back to the island after their night out, they would sleep in cowsheds until the weather improved. Paddy also had fond memories of the school and the final school teacher there. She was a 21 year old lady named Breege Henry. By 1959, she taught just 10 pupils at the school, all with the surname Gallagher, all brothers and sisters. Ms. Henry had been preceded by a Mr. MacNamara in the 1940s. Paddy believed him to be ahead of his time when he took it upon himself to use the school building as a night school for the adult islanders, teaching many of them who were illiterate to read and write. It’s clear from speaking to Paddy that the school house on Achill Beg was a focal point of life on the island. Now, with the former population aging and dispersed, it seems especially poignant to see the building wither and decay- even more so when you consider that there are many more similar structures on the off-shore islands gradually falling into disrepair, their significance being forgotten. If you or someone you know attended this national school, please do get in touch and share any stories, anecdotes, photographs, or any other memories you may have. You can do so here. If you would like to purchase the book The Deserted School Houses of Ireland, visit the shop page here. A sad and desolate air to this one, but good to get all the first hand information from Paddy. Life must have been so hard. The school on Sherkin has recently closed too.